Gustave-Auguste Ferrié (November 19, 1868 – February 16, 1932) was a French radio pioneer and army general. Ferrié was born in Saint-Michel-de-Maurienne, Savoie. After graduating from the École Polytechnique, Paris, in 1891, he became an officer in the French army's Engineers Corps, specializing in its military telegraph service. After being named to a committee exploring wireless telegraphy between France and England, in 1899 he carried out such communications in collaboration with Guglielmo Marconi. After being graduated from the ecole Polytechnique, Paris, in 1891, he became an officer in the Engineers Corps of the French Army. 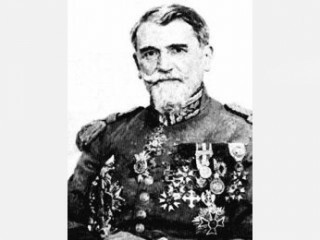 From 1893 to 1898 he advanced in the military telegraph service. When Ferrie was named to a committee exploring wireless telegraph communications between France and England, he found the subject on which he would focus his scientific career. In 1899 in Paris he participated with Guglielmo Marconi in experimental wireless telegraphy between France and England. In 1903 he proposed using the Eiffel Tower in Paris to mount antennas for long-range radiotelegraphy. Under his direction a transmitter was set up in the tower, and its effective range increased steadily from an initial 400 km (250 miles) to 6,000 km (3,700 miles) in 1908. He then turned to the development of mobile transmitters to enable military units to stay in radio contact with Paris. In 1903 Ferrie invented an electrolytic detector which has an operation more reliable than the coherer of Branly. But most writers of the day give credit for this invention, jointly, to Dr. Michael I. Pupin (1899), Professor Reginald A. Fessenden (1903) and W. Schloemilch (1903). This detector consists of a platinum cup containing a solution of dilute acid. The cup forms one electrode and the other consists of a wollaston wire sealed into a glass tube, which is drawn out very fine and then broken off, leaving only the cross-section of the wollaston wire exposed. Connection is made to the wire by means of the metal tube in which the electrode is mounted. The detector with high-resistance phones in series with it is tapped across two points of a potentiometer which has a battery across its terminals. The small current which passes through the detector polarises it – that is to say, gas is formed at the electrodes and the resistance thereby matarially increased. If now the arrangement be subjected to the small alternations of potential and current set up in a receiving circuit by the impact of electrical oscillations it will be depolarised, and the resistance of the electrolytic cell falling, a small current will pass through the phones and will be audible to the operator; after the arrival of each wave train the battery again polarises the cell, the device being thus self-restoring. To adjust the cell, the small electrode having been inserted in the holder and its point dipping into the electrolyte, the arm of the potentiometer is moved round till a hissing noise is heard in the phones, it is then moved back until the noise just ceases. The detector is then in its most sensitive condition. When World War I began, Ferrie, then a colonel, was named director of French military radio communications and assembled a corps of scientists and technicians who set up a network of radio direction finders from the English Channel to the Jura. During World War I Ferrie made extraordinary advances in the field of radio communication. Engineers had long known that telegraph signals could travel a few hundred yards through the ground, but little use had been made of this form of wireless communication. In 1914 Ferrie recognized two things: the newly available electron tube could significantly extend the range of this technique; and it might then be of enormous value in the fighting on the Western Front. Thus was born ground telegraphy or Earth-currents signaling. Ferrie made improvements in the signal generator and in the receiver – notably by the use of a triode amplifier – and achieved a usual range of several kilometers. The transmitter was essentially a buzzer (an electromechanical device that interrupts the circuit at a very high rate) powered by a battery. The receiver was an amplifier, employing a triode electron tube. Earth connections were usually made by driving steel pins into the ground; often a short length of insulated wire was laid along the ground and anchored at each end by a spike. These devices began to be used in large numbers in 1916, and by the end of the war the French had produced almost 10,000 of them for use by the Allies. Users of ground telegraphy discovered that their receivers frequently could pick up telegraph and telephone signals from lines buried nearby. They were thus used to tap enemy lines and also to receive one’s own telegraph or telephone signals when a line had been severed. These receivers came to play a large role in eavesdropping. Its portability and its freedom from electrical lines made ground telegraphy an important means of communication during the Great War. It was a technique, however, that scarcely outlived the war. Even before war’s end it began to be displaced by another wireless communication technique. This, of course, was radio, the technology to which Ferrie devoted most of his efforts. Ferrie created a radio section at the ecole Superieur d’electricite, Gif sur Yvette, France. He experimented with radio transmissions from aircraft to enable the aerial direction of artillery fire. Ferrie was made a General in 1919, and continued in the service for the rest of his life, exempted from the restrictions of the age limit ruling in accordance with a special law enacted in 1930. He received on Honorary Doctor’s degree from Oxford University in 1919, and was a member of the Academy of Sciences since 1922. He was president of the International Scientific Radio Union (U.R.S.I. ), the International Commission on Longitudes by Radio, and Vice President of the International Board of Scientific Unions. He became a Fellow of the Institute of Radio Engineers in 1917. Ferrie was awarded the IRE Medal of Honor in 1931, in consideration of “his pioneer work in the upbuilding of radio communication in France and in the world, his long continued leadership in the communication field, and his outstanding contributions to the organization of international cooperation in radio.” He was also the first president of the French National Committee of Geodesy and Geophysique (from1920 till 1926). Gustave-Auguste Ferrie died on 16 February 1932 at the 65 years age. View the full website biography of Gustave-Auguste Ferrié.